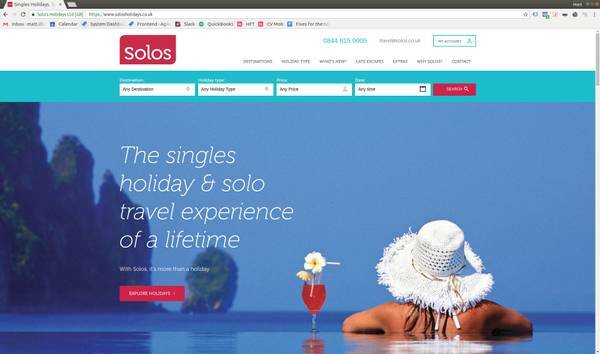 The challenge: Solos Holidays website had some significant issues in terms of mobile responsiveness, style and usability. Customers and staff were finding it frustrating to find the right products and the company needed a foundation for their ambitious online strategy. Getting the website right was important. Phase one of the project (live now) was to replace the dated website with a new site design (Graphic design provided by Oliver & Graimes), significantly improved search, user journey and better mobile responsiveness. It has been integrated with their back office system (Anteeo) for Dates, Pricing and Availability. Phase 2 will be to replace the booking process and my account areas to further improve the customer journey. Mr Zen has delivered a truly stunning website supported by a comprehensive, flexible CMS which has greatly enhanced our SEM capabilities and we’re already seeing the return on our investment. Matt and his team are a joy to work with and I’m looking forward with confidence to developing our digital strategy, with Mr Zen being integral to our efforts. Andrew Williams, MD Solos Holidays. If you are a specialist tour operator with complex requirements, and need someone who understands Travel, then give us a call!